Microsoft has unveiled a slimmer version of its Xbox One console, the Xbox One S, including another new console, Project Scorpio, that will offer virtual reality and 4K gaming at E3 in Los Angeles. 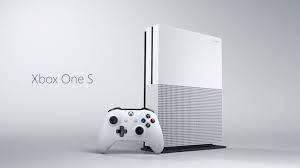 The new Xbox One S takes the original Xbox One, shrinks it down and it gives a fresh coat of white paint (Microsoft calls it “robot white”). The result is a striking new design that is stands in stark contrast to Microsoft’s previous consoles. The device is 40% smaller than the original Xbox One, according to the company, and also does away with the frustratingly bulky power supply which is the Xbox line is known for. And unlike the original Xbox One, the new console also gives you some choice on how to display it, all thanks to an optional vertical stand. The Xbox One S, however, will cost $299 (£210), which will launch in August and include support for High Dynamic Range (HDR) gaming, with extra levels of brightness and more color. The Xbox One S also includes a few other improvements compared to its predecessor. Most notably, there’s 4K Ultra HD video support (including 4K Ultra HD Blu-ray) and the HDR capabilities for both gaming and video. Meanwhile, one of the console’s USB ports has been shift to the front for easy access, along with the controller pairing button, and there is a new built-in IR blaster. One thing has been removed, however: the Xbox One S doesn’t include a dedicated Kinect sensor port. If you really want to hook up a Kinect for voice controls you’ll need a separate USB adaptor.